Designed for protection and flexibility, the Squires Leather Gauntlets guard your forearms and hands from harm. 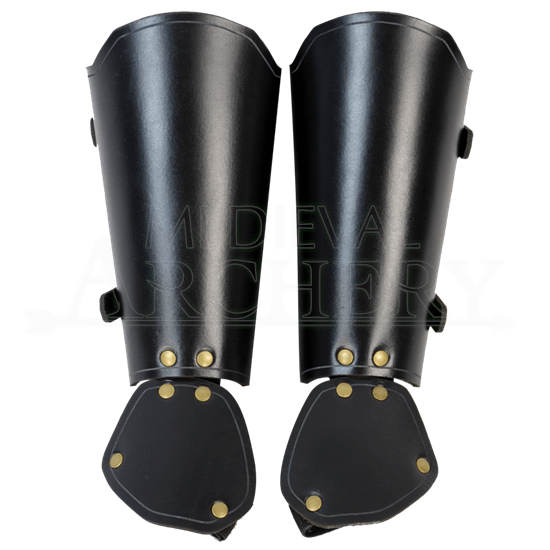 A flexible piece of suede connects the hand guard to the arm bracer, allowing for uninhibited use of your hand and wrist which is particularly helpful when you find yourself in a sword fight. The hand guard stays attached to the hand with a black elastic band, providing a comfortable means to keep the guard in the optimal position. The bracers attach to your arm by two sets of straps and buckles, one at the forearm and one at the wrist. These sleek bracers are available in a variety of colors, ensuring they will complement your other armour. They are constructed from 7/8 ounce leather and are detailed with antique brass hardware. Be prepared for battle by incorporating the Squires Leather Gauntlets to your collection of armour.